Happy Valentine's Day everyone! The once cynical single girl turned girl in a relationship is now celebrating Valentine's Day for the first time and into it. I feel so silly, like the typical girl who just flip-flopped her mind because she has a boyfriend but hey, we all do it at some point in our lives. 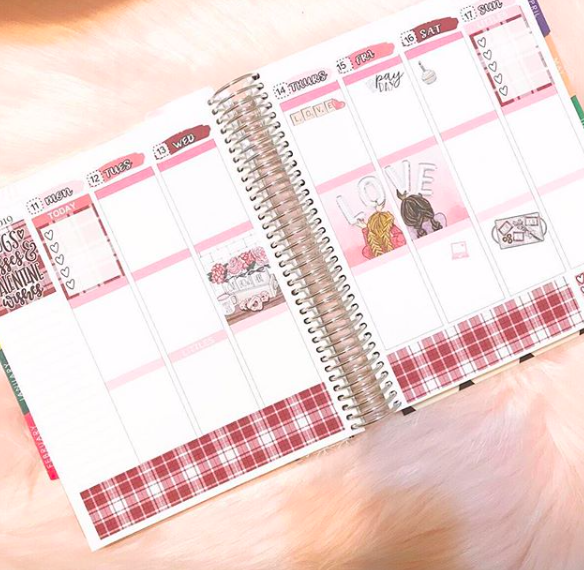 My Erin Condren planner layout for V-Day week! Originally for today's blog post, I was going to talk about lowkey date night ideas but that doesn't sound like me and just really felt inauthentic. I thought it was much more on brand for me to ramble about my thoughts on Valentine's Day! Tonight, I'll be headed to my boyfriend's house because he is going to cook me dinner, and we'll probably just watch a movie... and that sounds great to me! I'm not someone who loves to go out and would much rather just spend a nice little night at home, with him and relaxing. I think if done right, done in a way that celebrates you as a couple, Valentine's Day is really special. It's when you feel the need to go over the top and out-do other couples that Valentine's Day becomes ridiculous and pointless. Valentine's Day doesn't have to be extravagant, beautiful, or overly planned. Sometimes, simple is best and when it comes to spending time with your significant other, or just your friends and/or family that's what matters. It was hard being single on Valentine's Day and, to be honest, sometimes I forget that I'm not single anymore because it just feels normal. However, I always tried to make the best of it! In college, my friends and I would drink, watch movies, and craft because Valentine's Day always fell around Big/Little reveal so it was a good excuse to combine both holidays! After I graduated, I'd buy myself something special, treat myself to a pastry and just try to act like it was a normal day. No matter what, celebrate yourself and love yourself today because without self-love, no other love matters. Also, candy is 50-75% off tomorrow so make sure to go to CVS and stock up!